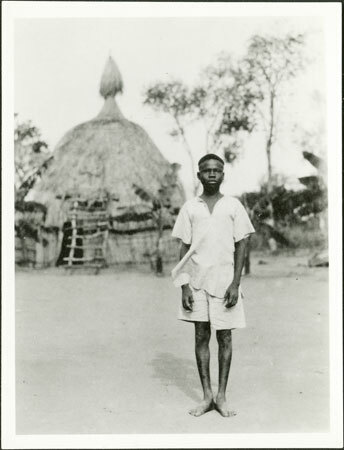 A portrait of a youth (identified as Zakiri) in shirt and shorts, with a large old-style granary (type known as soro) in the background. A boy named Zakiri worked for Evans-Pritchard as a household servant during his fieldwork. Morton, Chris. "Portrait of a Zande youth" Southern Sudan Project (in development). 03 Jan. 2006. Pitt Rivers Museum. <http://southernsudan.prm.ox.ac.uk/details/1998.341.235.2/>.